After he endured four back surgeries and the fallout from his marital indiscretions, a lot of people thought former world No. 1 golfer Tiger Woods would never win his 15th major tournament. 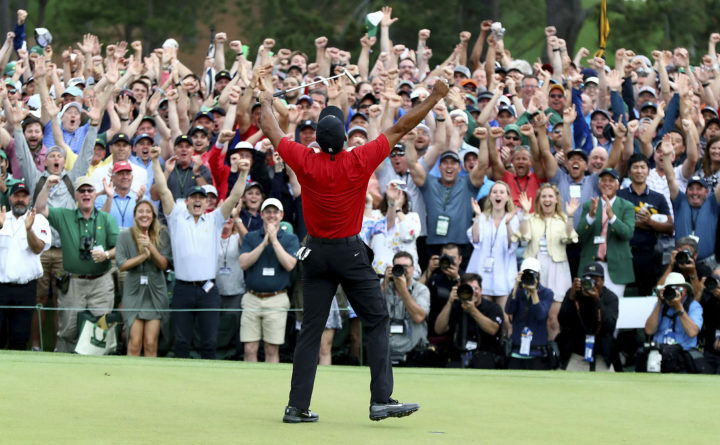 But he did so in dramatic fashion Sunday, claiming his first Masters since 2005 and his first major since he won the U.S. Open in 2008. His one-stroke victory marked the first time in his illustrious career that he trailed entering the final round of a major but came from behind to win. He was the second-oldest golfer to win the Masters behind Jack Nicklaus, who did so at 46 in 1986. Woods played in just one tournament during a two-year span (2016-17) while recuperating from back surgery. In addition to his back, Woods has also had to deal with heel and Achilles’ tendon injuries. Some Maine golfers and pros admitted they were surprised Woods was able to come back and win a major. Others were not. Hogan was involved in a car accident in 1949 in which he suffered a double fracture in his pelvis, a fractured collarbone and left ankle, chipped ribs, and near-fatal blood clots. He recovered and won the U.S. Open in 1950. Mark Hall, the pro at the Penobscot Valley Country Club in Orono, also did not think Woods would win, but said his swing has never looked better. “He’s so much smoother than he used to be. He used to be herky-jerky,” Hall said. Former Bangor Municipal Golf Course pro Brian Enman believed Woods would eventually win another major. “Because he’s probably the greatest golfer of all time and has a lot of determination,” Enman said. Rick Ambrose of Glenburn, who has won several tournaments during his impressive career, predicted that it won’t be the last major Woods wins. Ambrose said that in addition to his ability to outthink opponents, he also has the ability to escape precarious situations. “He’ll hit a wild tee shot but is always able to pull off a shot that gets him out of the woods. For anyone else, it would be virtually unplayable,” Ambrose said. Smart said Woods is able to maintain his composure and put pressure on other golfers. “He is a mentally tough competitor, and I think that got to the other guys [on Sunday],” Smart said. Enman said Woods’ vast experience, especially at Augusta National, played an important role in Sunday’s victory. Hall pointed to Woods’ approach on shorter putts as another dynamic that put him over the top. He said the accomplishment is even more remarkable when you take into consideration the number of quality golfers on the PGA Tour nowadays. “The competition is tougher than it used to be,” said Hall, who recalled the time 10-15 years ago when Ernie Els and Phil Mickelson were Woods’ primary challengers. Hall also likes the change in Woods’ demeanor, which appears to be a result of his considerable struggles on the way back. “He’s more humble. He can smile and laugh. He really had trouble doing that before,” Hall said. The Mainers all agreed that Woods’ resurgence will be good for golf. “Right after the Masters, we had a bunch of guys 18 to 25 years old come out and play nine holes. They were all excited,” Hall said.